I was working a solution to a StackoverFlow question and felt I could elaborate on the answer just a tiny bit. In the original question, the questioner asked why they were unable to assign a decimal value (a float) to a cell in a pandas DataFrame. You can see the original question here. The question focused on trying to assign the answer to the following division equation to a cell in column 1 and row 1. Instead of getting a float, an integer is stored in that cell. pandas appears to be presuming that the datatype is an integer (int). This is because by default, pandas attempts to infer and assign a datatype to a column based on the data stored in the column. This link to the pandas documentation has a summary of the types of data that can be inferred. If, when created, a DataFrame has integers stored in a given column, then you can’t later store floats in that column unless you set or change the datatype. There are several ways to address this issue, either by setting the datatype to a float when the DataFrame is constructed OR by changing (or casting) the datatype (also referred to as a dtype) to a float on the fly. Let’s look at both techniques. Counter object, which greatly simplifies the counting of objects. We do so, using the .most_common() function. Interesting, we can see the elements organized into groups, based on the actual character, number, etc. The .elements() method creates an iterable object, so to easily see the contents, it is common to encapsulate the result in another function, such as list() or sorted(). The linked file (1138090f) is based on an Official Scrabble Word list. NOTE: while it is labeled as a .doc file, it is really a .txt file, so you don’t need any special libraries to open it/read it***. The words will reveal the secret phrase. PyNow! the first ever Python Conference in Hawaii is looking for speakers, like you! to give talks on the following, sign up here! Things are happening at PyHawaii: more meetups. 0) a weekly series of unstructured meetups (starting on July 22nd). 1) a monthly series of larger, social structured meetups (starting on July 24th). Visit our meetup site for details on the when and where. Can’t wait to see you there! 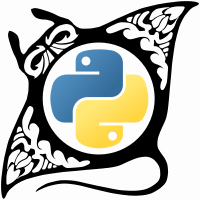 Interested in being even more involved with the Pacific’s Premier Python User Group? Join our pyhawaii.slack.com community, where you can chat, share resources, ask questions and more: email us for an invite at chalmer@pyhawaii.com. Dark Art of Coding is a founding sponsor for PyHawaii and we want to congratulate them on their first event – a huge success! * Padawan Track – Dark Art of Coding led the training for absolute beginners using hands-on learning opportunities. * Padawan Track: new to programming/Python? we’ll get you started with a one-hour lesson on Python Basics for complete newbies. Have ideas about PyHawaii or future renditions of it that you would like us to consider? Let us know! Add them to our google doc. Want to do the puzzles? Dive in right here! Enjoy your time here, with us. If you have any questions, ask! We are here to help. Also! Welcome to our friends in the HIPUG Meetup group! and at HiCapacity! pyhawaii@googlegroups.com OR Let us now if you want to be in the conversation via Slack!